The horse-powered 5KPlayer is a second-to-none choice if you need to play HEVC Windows 10 quite often. Unlike the rest of the H.265 players out there in the market who only come with entry-level HEVC support, 5KPlayer is backed-up by its sharp Hardware Acceleration engine that can uplift your overall HEVC playback experience. Now free download the tool below to smoothly play HEVC Windows 10 (also available for macOS Mojave and earlier). To make it clearer: Installing both the 2 versions of HEVC Windows 10 video extension means you can play HEVC H.265 coded videos in 4K UHD resolutions everywhere on Windows 10 – including web-browsers, video players and etc. Both of them, like self-integrated HEVC player Windows 10 like 5KPlayer, invoke hardware capabilities of your Windows 10 computer to facilitate HEVC playback when available, and for PCs without such UHD video processing hardware unites like Intel QSV, NVIDIA CUDA graphic card, it helps HEVC H.265 videos to play, which otherwise won’t open at all. That been said, the $0.99 HEVC Windows 10 video extension is an option worthy of consideration when you often use the computer to play short video clips encoded in HEVC 4K. But playing a feature-length movie in 4320p without a standalone HEVC video player Windows 10 often means the device gets burning hot. After the review of HEVC video extensions Windows 10, you may start to take a look at the free HEVC player - 5KPlayer. When to Use HEVC Windows 10 Video Player - 5KPlayer? For longer-duration playback of High Efficiency Video Coding files, it's almost imperative to use a free HEVC Windows 10 video player – 5KPlayer. The software excels not only as the best H.265 video player 2019, it virtually outperforms the majority of HEVC players Windows 10 with outstanding three-trail hardware acceleration support: enable NVIDIA or Intel QSV hardware acceleration mode when you have them either on computer, or DXVA 2.0 to accelerate HEVC playback on Windows 10. First, launch 5KPlayer on your Windows 10 computer & enable hardware checking according to the picture given below, If the blank after NVIDIA is checked after the run, you may use 5KPlayer to enable NVIDIA-powered HEVC Windows 10 playback right now. Second, directly go to My Computer > System and Security > Device Manager > Display adapter to see if your GPU is an NVIDIA one. Intel QSV: Repeat either of the method given above to see if your computer is shipped with an Intel QSV chip. After 5KPlayer scanning, you may find your computer shipped neither of the 2 chips mentioned above, does that mean you won’t be able to play HEVC Windows 10 at all? Now you may look to the third option in the HWA panel of this HEVC player Windows 10 – DXVA 2.0, aka DirectX Video Acceleration from Microsoft, is able to offload HEVC Windows 10 processing tasks from the CPU to GPU even if it is neither NVIDIA nor Intel, a utility virtually helpful to achieve exactly the same performance as HEVC video extension Windows 10 that cost $0.99. Step 1: Free download 5KPlayer free for Windows 10 computer, install and launch it. Step 2: You need to first enable hardware acceleration before trying to play H.265 H.264 HEVC videos on Windows 10/8/7, to do this, go to 5KPlayer’s setting panel > scroll to HWA tab > check “Allow H/W Acceleration”, then hit on “check hardware” to start hardware scanning. 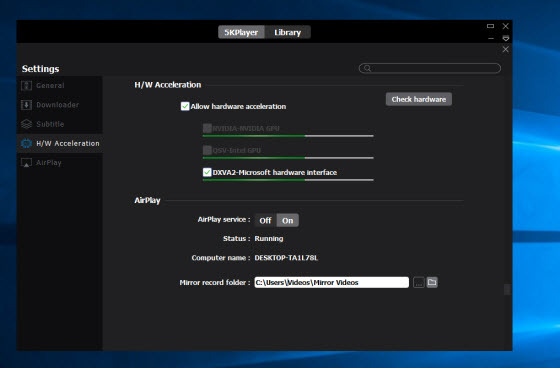 Step 3: Enable the HWA option available on your computer to play H.265 HEVC on Windows 10. If you plan to send a 4K 8K HEVC video to a friend without 5KPlayer or any other tool to help play HEVC Windows 10, you can stay with 5KPlayer to convert HEVC to MP4 on Windows 10. Step 1: Open the HEVC video on computer & add it to your playlist. 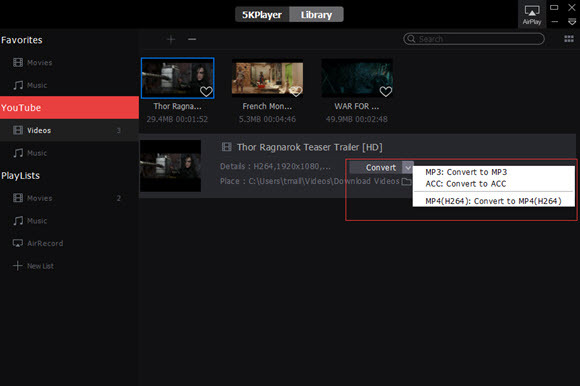 Step 2: Locate to the video in 5KPlayer’s playlist, and next to the video thumbnail you’ll find a drop-down option, hit on it, and in the list dropped therefrom, choose Convert to MP4. 5KPlayer has managed to make itself a reliable 8K video player from as early as 2015, with a slew of new functions such as hardware acceleration utility added ever since, now you may use it to play HEVC Windows 10 without downloading HEVC video extension Windows 10. Now check to free download it below. How to speed up high-res video playback? Video accelerator can help decode and render 8K 4K videos fast and smoothly. Want to save your Media Player Classic from crashing problems on Windows 10/8/7 or when playing video files? Here is the way.